Abstract: In this article, we will see how to log the SQL queries that get generated by Entity Framework. We will also some see profiling tools available. So far, in our Entity Framework 4.0 Article series, we have covered some basics of the what, why and how of Entity Framework 4.0 and also performed some CRUD operations with Entity Framework. We have also seen how to create an independent Entity Data Model and bind the Model to controls like the ASP.NET GridView. In this article, we will see how to log the SQL queries that get generated by Entity Framework. We will also list profiling tools available. With the Entity Framework, you are architecting, designing and developing at a conceptual level, without worrying too much about the specific details of communicating with the database. 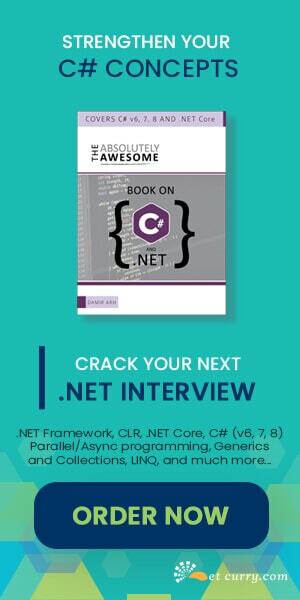 Entity Framework uses ADO.NET classes (like the SqlClient) behind the scenes to convert code into SQL queries, with the details abstracted from you. In this article, we will see how to watch some of the SQL queries generated using the ObjectQuery.ToTraceString() method. We will create a simple logging mechanism that will log the query to a .txt file. You can then send the .txt file to your DBA or check the queries on your own for performance improvements. 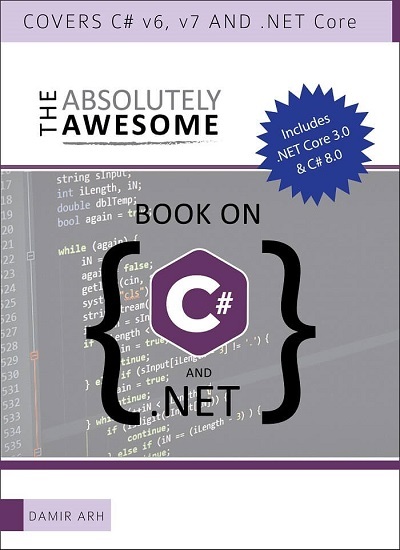 Note: The ObjectQuery class implements common functionality for queries against a conceptual model using both LINQ to Entities and ObjectQuery<T>. 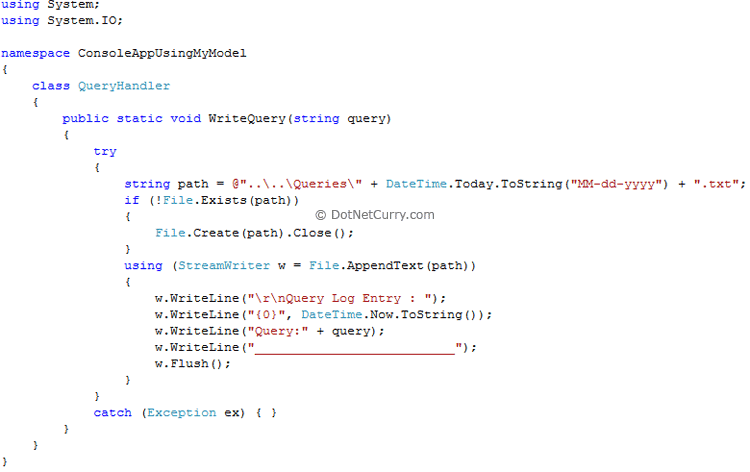 Read my article Exploring how the Entity Data Model (EDM) Generates Code and Executes Queries – Entity Framework 4.0 to see how ObjectQuery functions. Note: The query handler shown above is a very simple query logging mechanism and can be used by developers on their machines to log queries. In no way, should you use this logging mechanism on your production server. Explore Log4Net for advanced logging scenarios or use the different logging and profiling options listed above. As you can see, to retrieve the query generated, we are casting the result of the LINQ to Entities query to an instance of ObjectQuery class and calling the ToTraceString() method on it. We are then passing this string to the QueryHandler.WriteQuery() method to log it. Only one log file gets generated for each day the application is run. Note: You can see only some queries using the ToTraceString() method. For eg: Queries which make use of Single() or make use of Lazy loading or insert, update, delete are not logged. Although Entity Framework generates the query for you, it’s important to be aware of what’s happening in your database! In this article, we explored how to log simple queries. For advanced profiling scenarios, feel free to explore the other tools I mentioned at the beginning of this article. 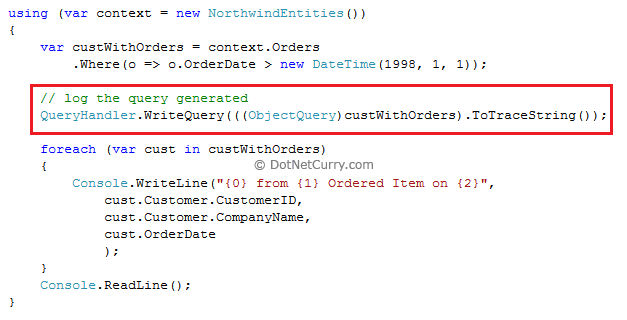 Queries generated by entity framework are editable? In other words can we edit the queries to make them more readable? Or even edit queries to make them perform better! very usefull for beginners, thanks you 4 investing time.